Sunday UPDATE: Teens, tweens and a few folks outside those two demos hit the multiplex this weekend to chew on Warm Bodies. The zom-com performed slightly higher than expectations with 60% of its audience female, 65% under the age of 25. It'll own that market until the next Twilight-inspired supernatural romance, Beautiful Creatures, drops on Valentine's Day. And poor Sly Stallone, guy suffered a worse fate than Ahnold's The Last Stand – Bullet to the Head brought a butter knife to a gun fight, banking $4.5M, Stallone's worst opening ever. Rocky VII: One, One, One, One, One, One More Time is officially an inevitability. I speak of wild cards often on this here Projector – films whose box office fortunes are nasty difficult to nail down. 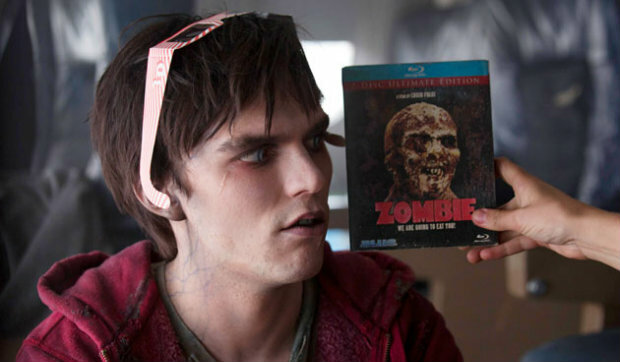 We get one this weekend with Warm Bodies, a zombies-subbing-for-vampires Twilight. Well, that's what the perception seems to be, even if it's light years better than that. In fact that's an insult to the witty lil' zom-com, an agreeable diversion compared to the typical dreck released this time of year. Expect it to do rather well in the word of mouth department, not to mention, its core audience doesn't give a rats about it being Super Bowl weekend. Warm Bodies $18.5M - While my instinct is to go higher here, the aforementioned Twilight comparison is more likely to hurt the film than help it. The lack of cast recognition doesn't work in its favor either. Hansel & Gretel: Witch Hunters $9M - Last weekend's champ takes a nasty tumble off the monetary cliff but sticks around for one more weekend before rolling to Netflix. Silver Linings Playbook $7.5M - While it's been whiffing at awards shows (outside Jennifer Lawrence's success), Harvey Weinstein's dramedy has pocketed nearly $75M and has had stellar weekend-to-weekend holds. Bullet to the Head $7M - Sly Stallone sits in the solo-headliner chair once again but things will likely go the same way they did for Arnold a few weeks back – not so well. Zero Dark Thirty $5.5M - As its shot at Best Picture fall further and further – and further, a win at this weekend's Directors Guild Awards would be a solid dose of redemption for its Oscar-snubbed director.